Soon-to-be college freshman Evie Claremont had hoped that once she'd arrived on Crestwood's campus, the nightmare that she'd been having would go away. It hasn't. She may be an inexperienced seventeen-year-old, but she's grounded . . . sane. She looks for rational explanations to even the strangest circumstances. Since meeting sophomore Reed Wellington, however, nothing makes any sense. Whenever he's near, she feels an attraction to him-a magnetic kind of force pulling her towards him. Unfortunately, Reed acts as if Evie's the worst thing that has ever happened to Crestwood . . . or him. But for some reason every time she turns around he's there, barging into her life. What is the secret that he's keeping from her? Evie's hoping that it's anything but what she suspects: that he's not exactly normal . . . and neither is she. So, maybe Crestwood won't be the making of her, but it could be the breaking of her. Evie's now left to wonder if the dark future her dream is foretelling is . 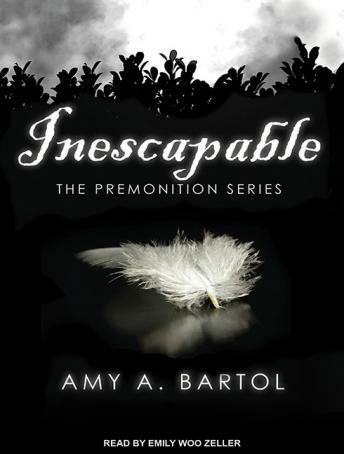 . . inescapable. It was an okay book. Picked up in the last 100 pages. Not a huge fan of the person reading the book, and it seemed like her speech was way too fast towards the end of the recording.